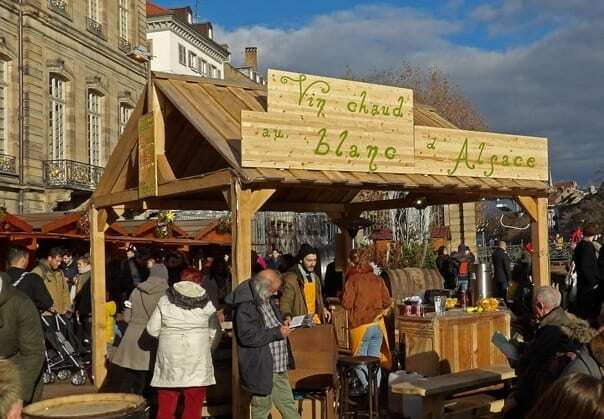 Is it because Alsace is one of Europe coldest region or is it because Alsatians are warm-hearted people that Christmas time is so special in Strasbourg? Never mind finding an answer to that question, all I know is that since 1570 the traditional Christmas market that takes place in this wonderful town is one of the best places on earth to feel the magic of Christmas. 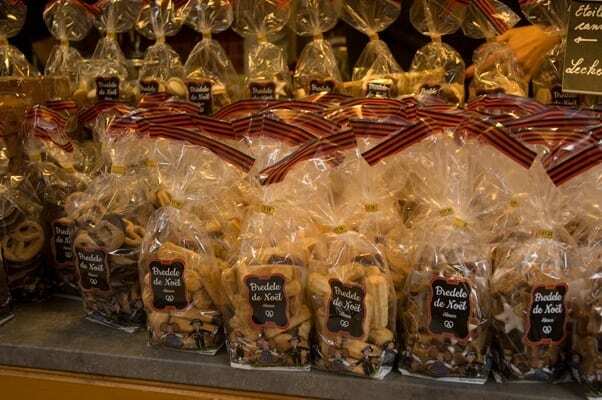 Come and discover the oldest French Christmas market. 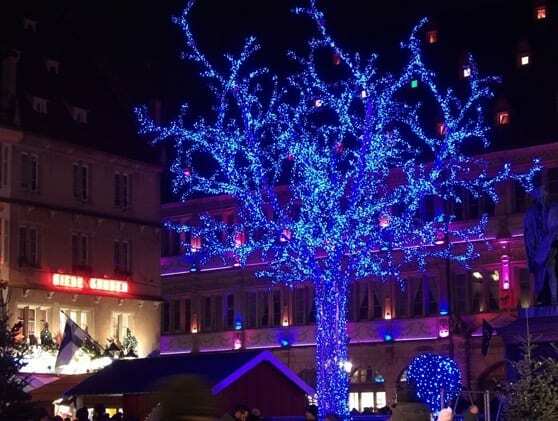 Once again and for the 448th time the streets and squares of Strasbourg historic city centre are filled with joyful Christmas lights and with tempting aromas of gingerbread, chocolate and mulled wine. Folk traditions passed from generation to generation are revived from the first Saturday of Advent till Epiphany while street shows and Christmas carols concerts create a festive atmosphere. Every day as darkness falls the huge Christmas tree set on Kleber Square shines like a beacon drawing people coming to admire the highest natural decorated tree in all Europe. This year it is 30 metres high! Strasbourg’s Christmas market isn’t only the oldest one in France it also is the largest one. 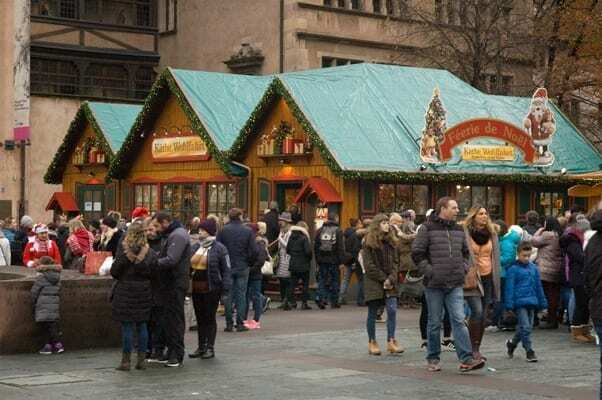 Three hundreds small “chalets” selling all kinds of Christmas decorations and plenty of Alsatian specialities invades the streets and squares lined with beautiful ancient half-timbered houses. It truly is the perfect setting for Santa’s village. In past years many of these small shops offered for sale cheap products “made in China”. The town council soon realised that this was going to besmirch the market’s reputation and put an end to this bad practice. 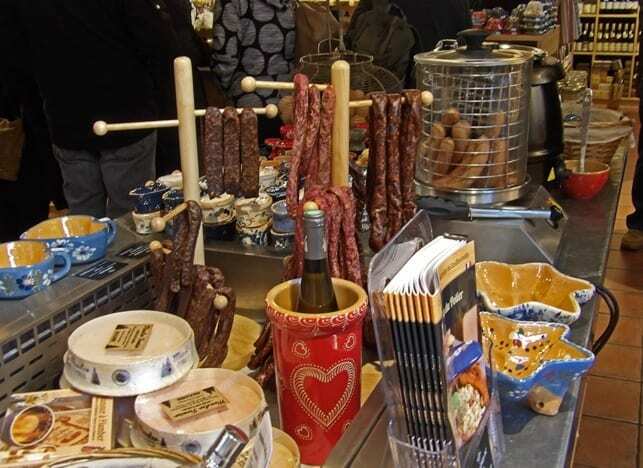 Today the market is proud to offer local products and you will be able to buy Alsatian crafts, wines and food. Many market stalls are dedicated to food. Alsace is renowned for its gastronomy and it well deserves its reputation. It is said that foie gras was invented in Alsace in the 17th by the chef of Marshal de Contades. It’s been a traditional dish of Alsatian festive dinner ever since and you will be able to order it in many restaurants and even at the market stalls. In Alsace mulled wine is made with Alsatian white wine heated with orange and lemon pieces, cinnamon, star anise and a little sugar. Its sweet aroma floats all over the market and it warms the body and elevate mood! 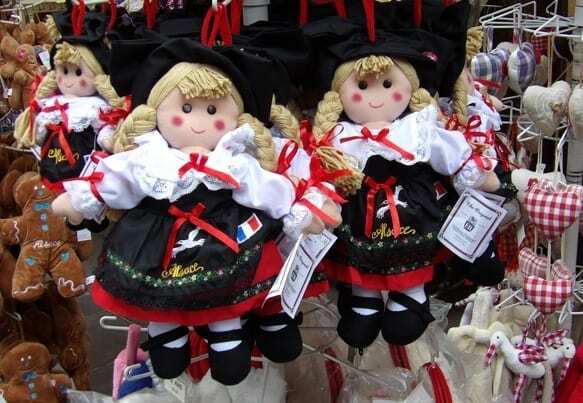 Every year Strasbourg invites a different country to share its Christmas traditions with all the visitors of the market. This year Finland is the guest of honour and several Finnish “chalets” have been set on Gutenberg Square. 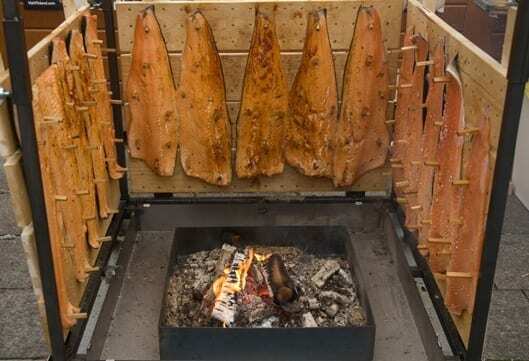 They propose Finnish crafts and Christmas decorations and an open-air restaurant where whole salmons are cooked in big wood ovens, cut into large pieces and served on slices of fresh bread. Spectacular and delicious! The “Golden Tulip Strasbourg-The Garden” is a brand new 4-star hotel that opened just a few weeks ago. 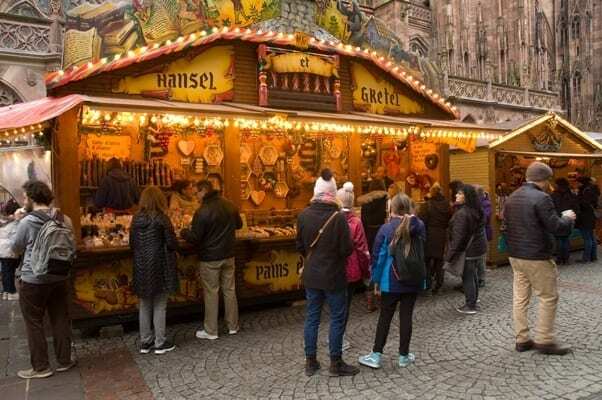 Ideally located at walking distance both from the railway station and Strasbourg city centre it will allow you to visit the Christmas market and all the other places of interest in town without having to drive. The hotel also provides bicycles for active guests. Most of the rooms are large family suites with one king bed and one sofa bed, both with top quality bedding. Many of them even have a sun-deck terrace making the suite even bigger. 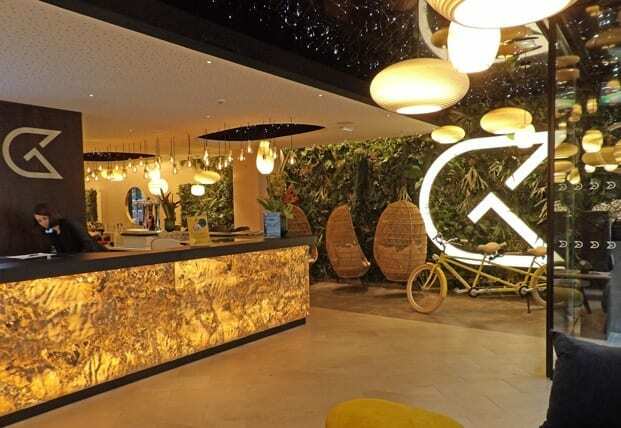 They welcome two adults and up to two children and it’s only a Euro-60 extra charge for the two kids including a hearty breakfast buffet for the whole family. When checking in each guest is invited to choose complimentary toiletries from a “body care bar” next to the reception. 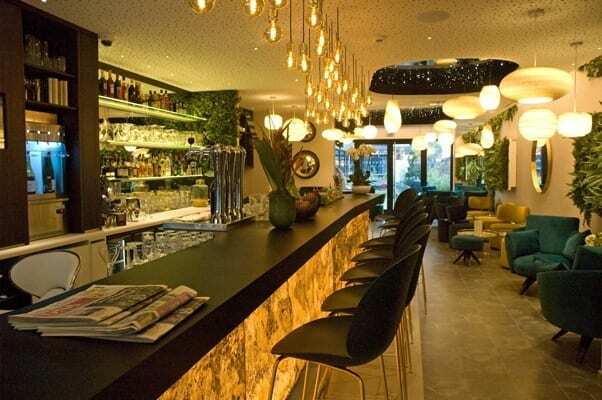 It makes you feel privileged right from the beginning of your stay. 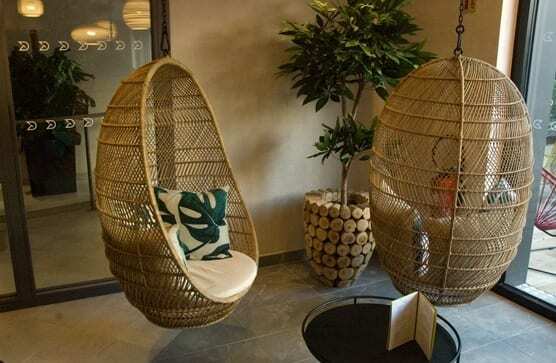 The hotel also has an indoor swimming pool, two light therapy cabins, Turkish baths and a spa with Alsatian healthcare products. 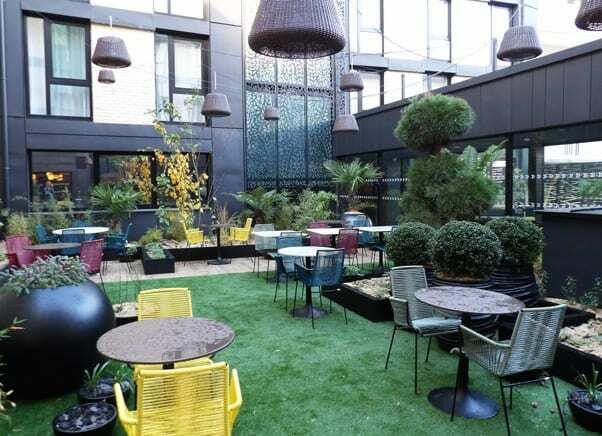 With no doubt the new Golden Tulip is the family hotel that Strasbourg… and tourists were waiting for.